As the camera scans the sidewalk, a used condom comes into view. After that, there are episodic dealings with drug use and prostitution delivered with the expected amount of visual grit and dramatic tone. "Window in the Wall," new single from K-Holes, fits perfectly. All info comes courtesy of Hardly Art. 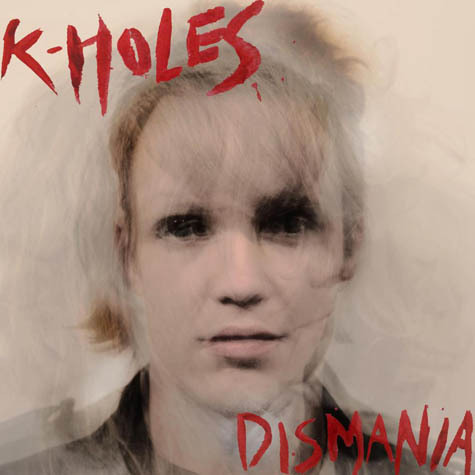 Some of this may be repeated from my last entry regarding K-Holes, which introduced their first single ("Rats") from the upcoming album Dismania. SPIN PREMIERES BEAUTIFUL, DISTURBING NEW VIDEO FOR K-HOLES' "WINDOW IN THE WALL"
VIDEO - "Window in the Wall"
With little over a month to go until the May Day release of their sophomore LP Dismania, K-Holes (New York's best live band™) have unveiled a new video for Side A closer "Window in the Wall." From its first, striking shot of a used condom withering on the pavement in the morning sun, this bleak-but-gorgeous video commands your attention. The clip, from filmmaker Sebastian Mlynarsky, employs the storytelling possibilites of the music video format to stunning effect. Two young lovers fight, swear, and reunite, unable to distentangle from one another and the abusive, drug-fueled life of codependency and hustling that they've fallen into. Dark stuff, to be sure, but presented with a deft and visionary touch--just like the music on K-Holes' Dismania. You can watch the video via SPIN.com at the above link. The K-Holes speak at once of the mystic and the cosmopolitan, the primal and the urbane, the earthen elements and their synthesized cousins. But unlike their contemporaries, the K-Holes’ sound is not of the grinning, gregarious panderer. Nor is it of the bored or at-ease. Rather, it’s the sound of escape. Escape from the concrete scrabble of New York, that moneyed parking lot for the cynical and privileged; escape from the vulgar materialism sung from the metropolitan mouth; escape from the vacuous r’n’r pantomime that smells of mere vaudevillian entertainment in any number of the city’s myriad dives. The K-Holes set these things afire, and in their stead, they proffer a wet hand, leading you, the listener, to another flame, a funereal white-hot pyre--one that promises more than sheer nihilism. One that promises freedom amongst cages of different shapes, sizes and colors. A way out. Their abdication follows a natural extension of the atrophied rock/roll ligament--unfurling from H. Williams to G. Vincent to Larry & the Blue Notes to the Pagans, Birthday Party, Flesh Eaters, Scientists, beyond--colored, at times, with smudges of primitive ceremony. As we follow their trajectory, running from the towering urban oppression, we catch whiffs of guttural noir in the honk of the sax, we hear the jagged swaths of guitar, we sense the bite and lust in their gang vocal. It’s fueled, all the while, by a low, thundering beat of tribal divination. Their burghal séance urges us onward, upward, and we sense the fire nearing. But the heat emanates not from the flame to which we run. It flowers from the cleansing pyre that has devoured us from the inside all along: the one that burns us up and tells us to move, in any direction at all, in any way we see fit, consequences be damned.